Cookie puzzles? Yes, indeed! Try this fun spin on any of our wafer papers and make your cookies into cookie puzzles with our Puzzle Cookie Cutter. 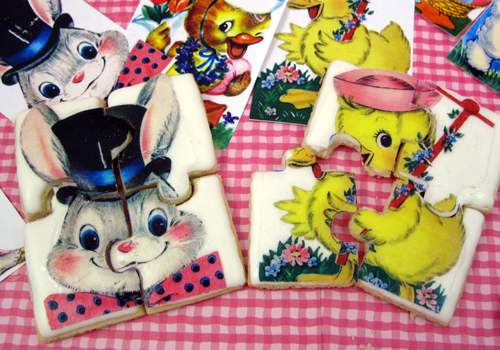 The Retro Easter Wafer Paper images featured above are the perfect size for our toast puzzle cookie cutter. Simply follow our HOW-TO recipe guide for step-by-step instructions for creating these fun and colorful treats. Then sit back while your friends and family piece the cookies together before happily gobbling them up! A fun idea for Easter morning!